“Bow Tank, Discharge Certificate,” 1896, Chinese Exclusion Act case files, RG 85, National Archives-Seattle, Bow Tank file, Seattle, Box 1260, Case 36207/1-11. Bow Tank was arrested on 4 April 1896 at Richford, Vermont. 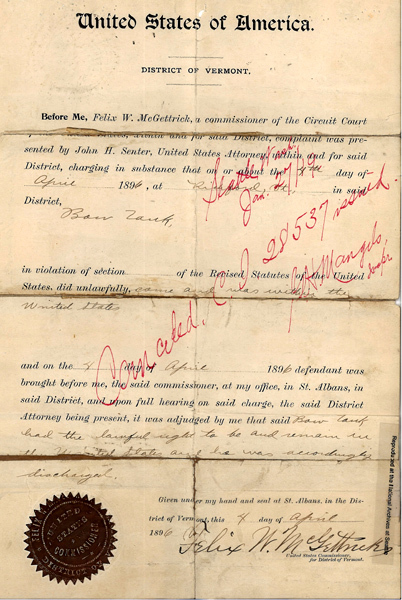 His hearing was held 24 October 1896 before Commissioner Felix W. McGettrick. He was issued a Certificate of Discharge. Witnesses: Moy Loy; E. S. Harris; Back Fook, Back Lee, New York. The total cost for the hearing was $26.70. That included drawing the complaint, issuing the warrant of arrest, subpoena for two witnesses, etc. Because Bow Tank had a McGettrick Discharge Certificate from 1896 the immigration authorities were suspicious of his credentials when he left the U.S. in 1916 and when he returned in 1919. Eventually his paperwork was approved. In 1919 he was a salesman for Quong Hing Lung Chong Kee and Company at 114 Park Avenue, Baltimore, Maryland.